USFD of Rails and Welds. 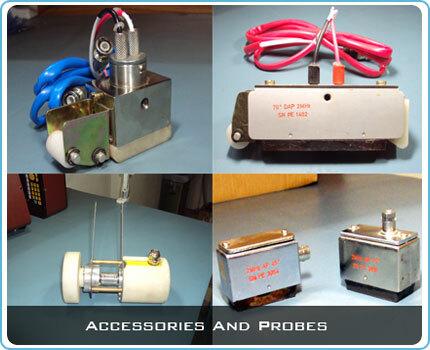 To check the proper functioning of the equipment and accessories. Connect the 00, 2 Mhz or 2.5 Mhz, Single Crystal Probe. Set any Range between 100 mm to 500 mm. Here range taken is 500mm. Set Probe Angle 00. Set Velocity of Longitudinal Wave – 5920 m/sec. Set Mode of Single Crystal probe – (T + R). Apply Couplant and Place The Probe on IIW Block at Position ‘A’. 5 Nos. of peaks will appear at 100 mm, 200 mm, 300 mm, 400 mm & 500 mm. Put the GATE on each Peak and notice the Deviation of each peak. Note the Maximum Deviation of Peak and selected Range. 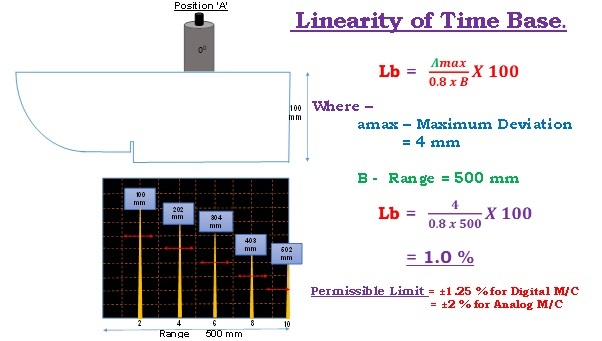 Calculate the Linearity of Time base (Lb) = (amax X 100) / (0.8 X B ). 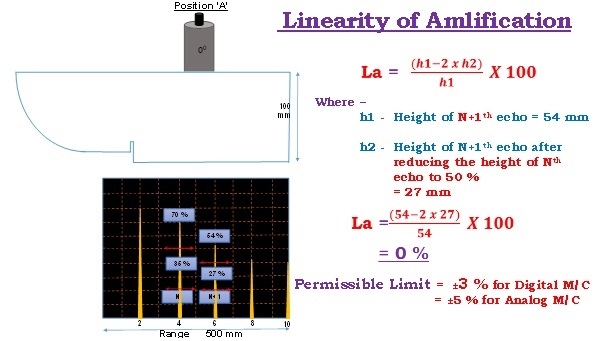 Where, "amax" is the Maximum Deviation of the echo and "B" is the Range. Permissible limit is ±1.25 % for Digital Machine & ±2 % for Analogue Machine. Apply Couplant and Place The Probe on IIW Block at Position ‘A’. Nos. of peaks will appear from 100 mm, 200 mm, 300 mm, 400 mm, 500 mm. Notice the Height of Nth echo and (N+1)th echo that is h1 at a particular gain. Reduce the Height by 50 % of Nth echo by minimizing gain. Notice the Height of (N+1)th Echo at that Gain that is h2. Permissible limit is ±3 % for Digital Machine & ±5 % for Analogue Machine. Apply Couplant and Place The Probe on IIW Block at Position ‘B’. Peaks will appear From 85 mm, 91 mm & 100 mm. Make the equal Height of 85 mm & 91 mm echo by twisting the Probe. Now Make the 100 % Height of both the echoes by increasing the Gain. Notice the Onset Point of Both the echoes (85 mm and 91 mm), whether it is above or below the 5 Divisions. If the onset point is below the 5 Divisions, the resolution power of Machine is O.K. Set Range 500 mm. Rejection should be minimum. 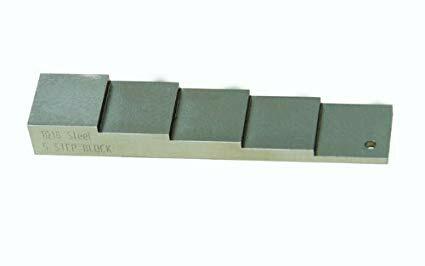 Apply Couplant and Place The Probe on IIW Block at Position ‘C’on Perpex of 23 mm Thick. The Peak will appear From base of Perpex. Increase the gain until 5 full peaks and sixth peak appearing on the screen. If Five full and the Sixth peak is appearing, the Penetration power of Machine is O.K. Connect the 700, 2 Mhz, Single Crystal Probe. 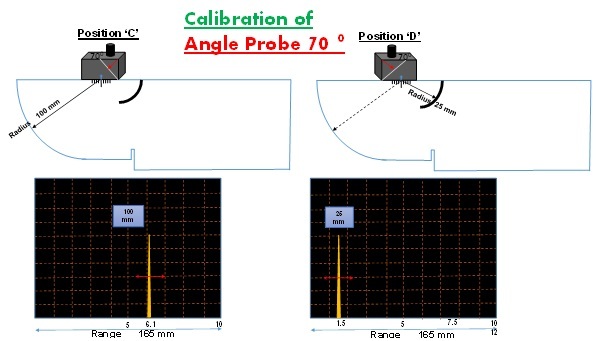 Set Probe Angle 700. Set Velocity of Transverse Wave – 3230 m/sec. Set Mode of Single Crystal probe – (T + R). Apply Couplant and Place The Probe on IIW Block at Position ‘D’. The Peak will appear From 100 mm radius. Maximize the Peak by moving the probe forward and backwards. Now Notice the Deviation between probe index and center mark of radius on IIW Block. The Permissible limit of Deviation is ±1 mm. Apply Couplant and Place The Probe on IIW Block at Position ‘E’. The Peak will appear From 50 mm Diameter Perpex. Maximize the Peak by moving the probe forward and backwards. 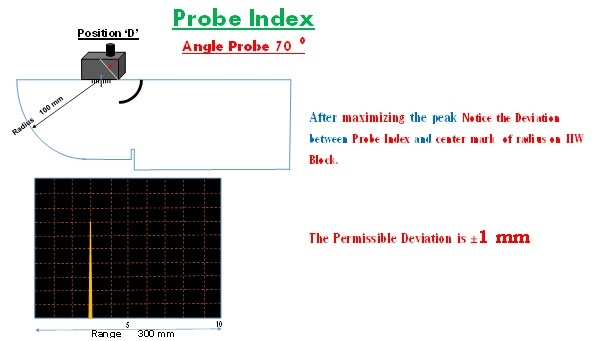 Now Notice the Deviation between probe index and 700 Angle mark of IIW Block. The Permissible limit of Deviation is ±10. Connect the 00, 2 Mhz, Single Crystal Probe. Apply Couplant and Place The Probe on IIW Block at Position ‘F’. Notice The Peak is appearing or not from 5 mm side. It may not appear. Apply Couplant and Place The Probe on IIW Block at Position ‘G’. Notice The Peak is appearing or not from 10 mm side. It Should appear. 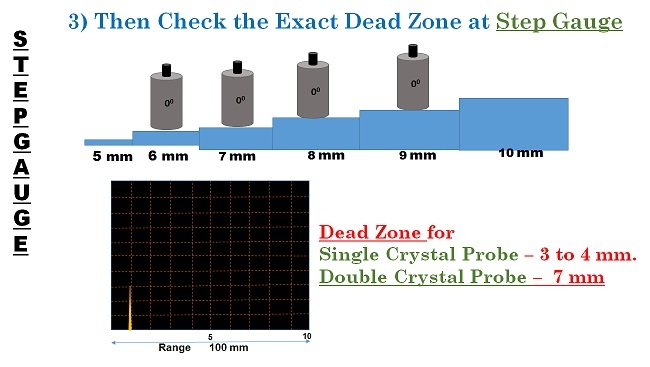 It means that Dead zone is within 5mm to 10 mm. Now Place the Probe on Step Gauge to check the exact Dead zone. Notice the exact Dead zone at which Step the peak appear. Connect the 00, 2 Mhz, Double Crystal Probe. Set Delay 0.0. Set Probe Zero 0.0. 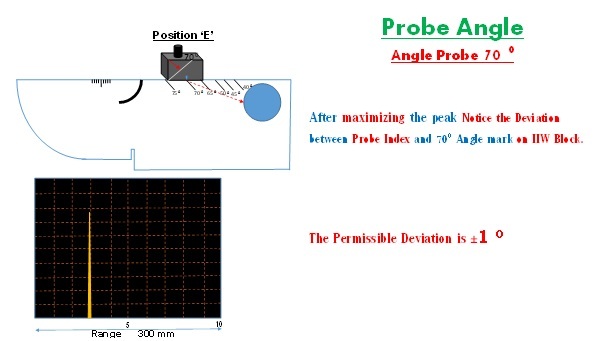 Set Probe Angle 00. Set Velocity of Longitudinal Wave – 5920 m/sec. 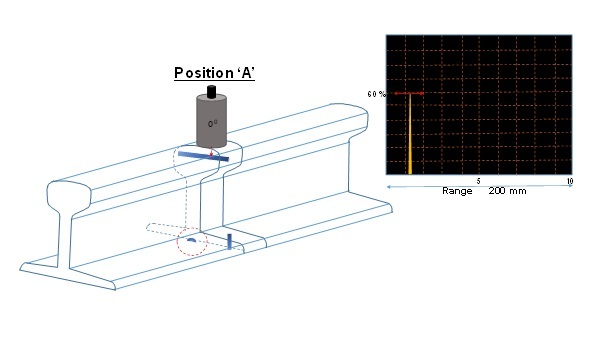 Set Mode of Double Crystal probe – (T - R). Apply Couplant and Place The Probe on IIW Block at Position ‘A’. Appears 2 peaks at 100 mm and 200 mm i.e. on 5 div. and 10 div. Put the GATE on 1st Peak and notice the Depth (D) in Machine. If D is not 100 mm. Adjust the peak by Probe Zero Key and make it at 100 mm. 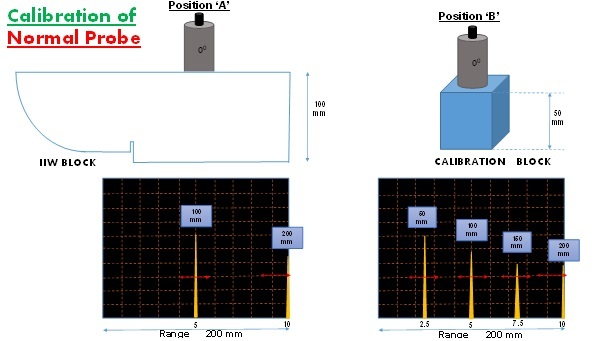 To Verify, Put the Probe on Calibration Block and Notice the Depth (D). Set Delay 0.0. Set Probe Zero 0.0. Set Probe Angle 700. Set Velocity of Transverse Wave – 3230 m/sec. 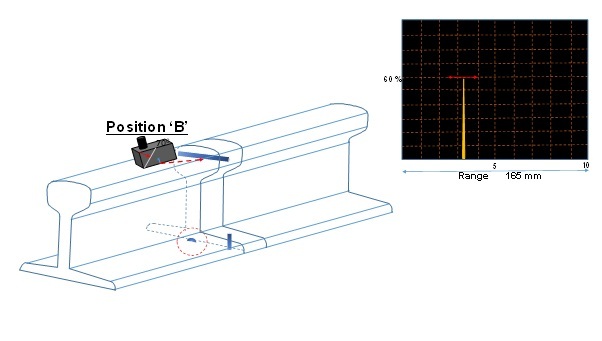 Set Mode of Single Crystal probe – (T + R). Apply Couplant and Place The Probe on IIW Block at Position ‘C’. Maximize the peaks from 100 mm Radius. Put the GATE on Peak and notice the Beam Path (B) in Machine. If (B) is not 100 mm. Adjust the peak by Probe Zero Key and make it 100 mm. To Verify, Put the Probe on IIW Block at Position ‘D’. Notice the peaks from 25 mm Radius which appears between 1 and 2 div. It should be 25 mm. Connect the 450, 2 Mhz, Single Crystal Probe. Set Delay 0.0. Set Probe Zero 0.0. Set Probe Angle 450. Apply Couplant and Place The Probe on IIW Block at Position ‘E’. Maximize the peaks from 100 mm Radius. Put the GATE on Peak and notice the Beam Path (B) in Machine. If (B) is not 100 mm. 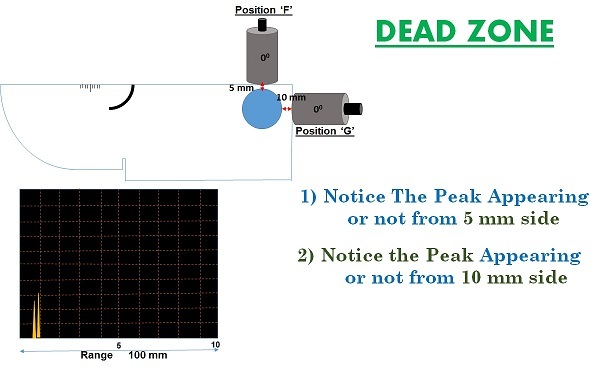 Adjust the peak by Probe Zero Key and make it 100 mm. To Verify, Put the Probe on IIW Block at Position ‘F’. Notice the peaks From 25 mm Radius which is appears between 0 and 1 div. It should be 25 mm. 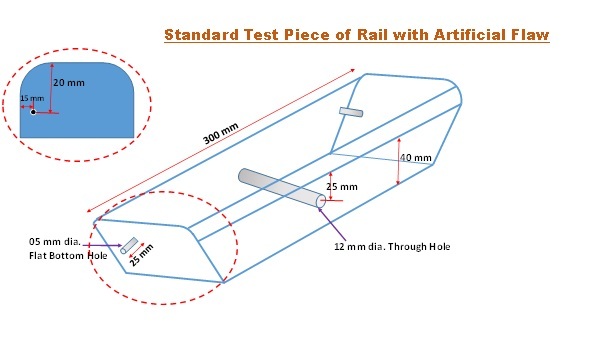 Apply Couplant and Place The Probe on Standard Test Piece on Position ‘A’. Peak will appear from 3 mm Dia. Hole in Rail Head. 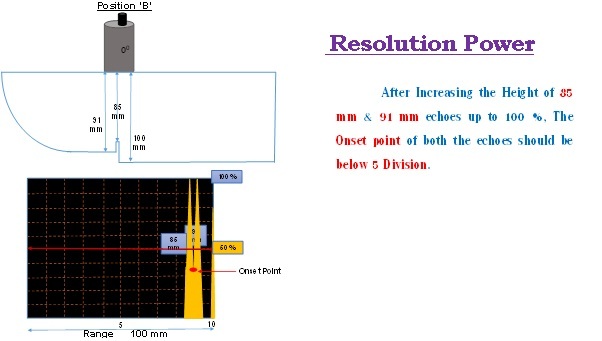 Make the Height of the Peak 60 % by adjusting the Gain. 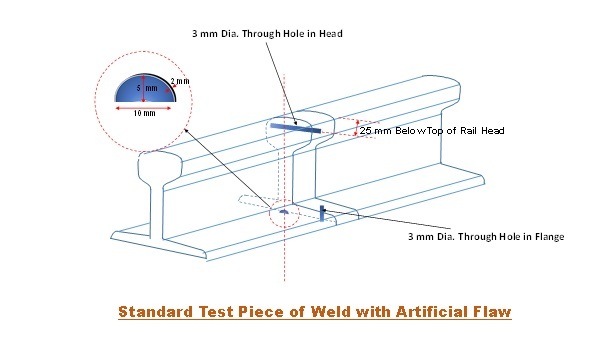 Apply Couplant and Place The Probe on Standard Test Piece on Position ‘B’. 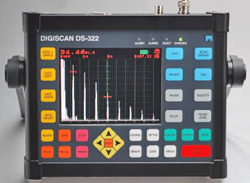 Maximize the peak by moving the probe receiving from 3 mm Dia. Hole in Rail Head. 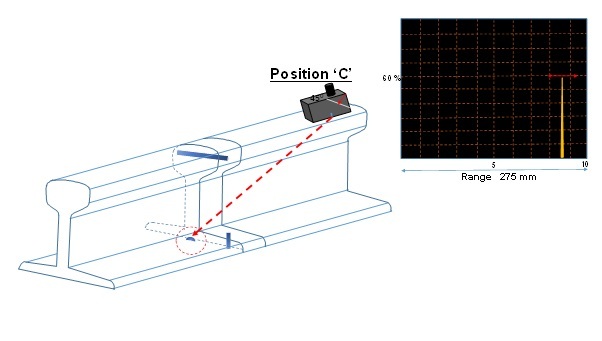 Apply Couplant and Place The Probe on Standard Test Piece on Position ‘C’. Maximize the peak by moving the probe receiving from 5 mm X 10 mm Artificial Half moon Cut. Switch on the Machine and run the Calibration mode. Move the Machine on Rail and notice the Back echo from bottom of rail. Make the Height of Back Echo to 100 % by increasing the Gain. 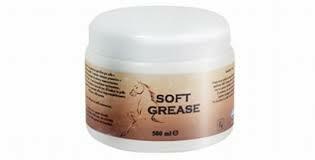 Save This Gain for Testing in Section. Move the Machine on Standard test piece of rail directing towards the 12 mm dia. through hole. A Moving peak will appear on screen. Maximize this Moving peak and set the height to 60 % by adjusting the Gain. Repeat this Procedure for Backward Probe. Move the Machine on Standard test piece of rail directing towards the 05 mm dia. Flat Bottom hole. Two Moving peaks will appear on screen 1st of Flat bottom hole and 2nd of inclined face. Maximize this Moving peak of Flat Bottom hole and set the height to 60 % by adjusting the Gain. Now Repeat the Same Procedure for Non Gauge Face Forward & Backward Probe.